A compact sized ‘cooler buddy’ for your home. A mini fridge may be small, but that doesn’t mean it won’t get the job done. It’s convenient to place almost anywhere in your home because it doesn’t take up as much space as a normal sized fridge. Storing a mini fridge in your room, office or hostel dorm is indeed handy for a quick cool drink on a hot and sweaty day. 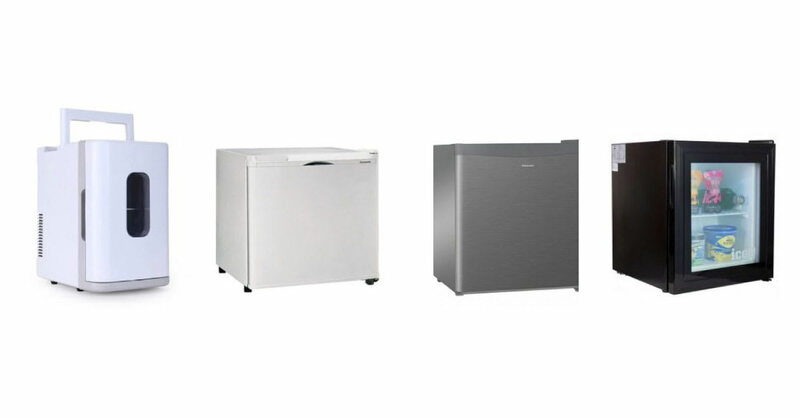 Select the best mini fridge for you with our top recommendations. Do you want to enjoy the luxury of home while travelling? The New Portable Mini Fridge allows you to kick back and relax with a drink even while you are in the car – great for road trips! Easy to use, just plug it in into your car’s cigarette lighter receptacle and enjoy a cool drink whenever you need it. This unit is protected with a locking latch to keep the items inside secure and insulated. The Midea Mini Fridge would definitely be a great roommate in your hostel room. With a 45-litre capacity, you could generously store fruits, snacks and drinks for a chilled snack any time of the day. The mechanical temperature control allows you to set the cooling system according to your need. An eco-friendly refrigerator, this is a reasonable and smart choice for students. A perfect choice for the single lifestyle. With all the features and functions of a regular refrigerator, the Panasonic 50L Minibar Fridge is an ideal cooler for your food and drinks. Energy-saving and efficient in design, it is well suited for those living in a small space, and on a moderate budget. Low in noise with no frost air-cooling technology makes this mini fridge as an optimal choice for your home. Place it in your living room or home bar and fill it with a supply of drinks and appetisers for the benefit of your guests. This sleek fridge is environmentally conscious as it has low carbon emission. On top of that, it has a very affordable price tag! Convenient for all outdoor activities, the Ippo Store Portable Mini Fridge ensures your tidbits and canned drinks remain cool and chilled for longer hours. This is a great option for those on a budget. Consider it a smarter alternative for storing your favourite food and drinks while watching television. You no longer need to wait for commercial breaks to dash into the kitchen for a quick bite. A perfect display showcase for your drinks, beautiful desserts or fruits. The OEM Showcase Mini Bar is suitable for a little café or kitchen. This mini fridge is fitted with a tempered glass door, a recessed handle and an adjustable shelf. It’s easy to maintain and comes at a fair price for such an elegant-looking miniature fridge. The Koolatron Coca-Cola Personal Mini Fridge has a fiery red exterior just like the classic cola can design. It can stock up to 6 cans of drinks, you will never have to remain thirsty for long. Compact in design, it would easily fit in your office or room to supply you with a refreshing drink anytime you feel like it. A classic-looking mini fridge, this would effortlessly fit in your bedroom and add a little extra flair. With a luxurious red coat and a versatile tabletop design, the Daewoo Retro Style Refrigerator caters to all your midnight snacking needs with its 79-litre capacity. From chocolate to bottled drinks, you can stock up with refreshments of your choice – you’ll never have to leave your room again!